Seventy-five percent of the time, website credibility is judged based on aesthetics (opens PDF) alone. Subject to both personal preferences and trends, the term aesthetics is painfully vague—which means the overall user experience is even more important. The next time you start a UX project, keep this checklist in mind. It will help you stay aligned with your business goals, understand your user, and avoid costly mistakes. Not all of your buyers will read and not all of your readers will buy. But you should know both your buyer personas and reader personas before you even think about UX. These fictional, generalized representations of your ideal customers will help you create more valuable content. When your buyer and reader personas align, it creates a more personalized user experience. Giving your reader a choice of format, industry, and vertical can go a long way. It can even be helpful to know their expertise or job function. For example, a financial officer will want different articles and solutions than an HR officer. And no matter how boring case studies, data, and white papers can be for a regular consumer, it’s critical for your B2B buyer. More than half of B2B buyers rely on content to research their buying decisions—and they want shorter, interactive content that educates. If you’re just starting, this step-by-step guide to creating reader personas will help you better serve your users. A smooth UX journey is a successful UX journey. An efficient user flow helps guide your users toward something. Do you want them to book a consultation? Buy a product? Download your ebook? Not everyone will start from the home page, and not everyone will have the same goals. Make sure your user has a clear journey from every corner. Everyone loves a good brainstorm session—especially when there’s snacks and coffee—but these meetings are often a waste of time. Not everyone thrives in that kind of public, high-pressure atmosphere. Sometimes it’s better when individuals think on their own, then come together to share their findings. Understand what your team needs and how they work best, then give them the space to work. For example, some teammates prefer to leave feedback as comments in a shared document. If user flows are explicit and you’ve planned your content hub well, wireframing should be easy. Avoid messy formats for your content inventories; they’re no help to your wireframe designers. Once you have a finalized content inventory, you can create a clear visual hierarchy. 5. Ensure all UI elements are authentic and accessible. Have you ever used an app or website and it feels like your fingers can never quite reach the right button? 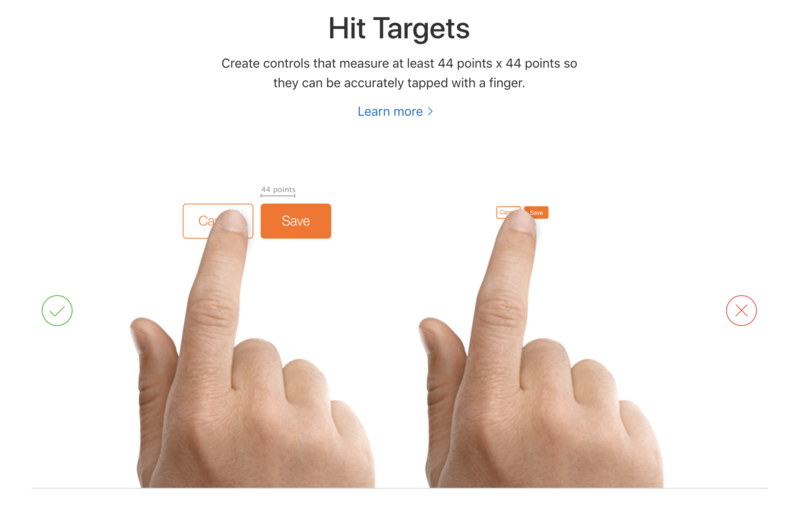 To be accurately tapped with a finger, controls should measure at least 44 points x 44 points. This example from Apple Developer perfectly illustrates how to size buttons correctly so that they can be accurately tapped. Another common issue is alignment. Sometimes you find a great product but the copy is too long, so you abandon ship halfway through. Align text, images, and buttons to show people how information is related. Make it easy for them to buy your product. When you have a good wireframe, it’s much easier to see the so-called red routes, or usability obstacles. Treat every UX case as unique. If a website has too many landing pages and forms, it often translates to a higher bounce rate. A good bounce rate is 26-40%; an ideal bounce rate is 0-25%. Language is a tricky business. And language that speaks to your brand personality and is properly implemented across all channels is even trickier. Your copywriters should create a clear set of brand guidelines before you even start. To maintain consistency, make sure you and your designers have a set of those guidelines in front of you at all times. Your writers—and customers—will thank you. Do you have a well-rounded hierarchy of colors, shades, and tints for your brand presence? Can they be applied across all channels? Make sure that your colors are recognizable on your main website and any other applicable channels (i.e. Pinterest might require lighter tones than Instagram). Despite the abundance of devices and tools on the market, many developers forget to check usability on various gadgets. Do not rely on your screen alone. Test your product on as many different devices as possible. Before you decide to save money on high-quality hosting or CDN, keep in mind that 40% of users left a website if it took more than three seconds to load. Reducing your site’s loading speed from eight to two seconds can boost your conversion rate by 74%. To compete in today’s marketplace, you need clean micro-interactions that grab attention and drive action. One of the best examples is Medium’s website claps. Each project should have key performance indicators (KPIs). How are these different from the tried and true conversion rates? They allow you to dig deeper to identify a solution. For example, a KPI could be the time before your users click. The longer this becomes, the more obvious it is that there are obstacles like load time or content length standing between you and success. Reverse engineer the tools you need. Start with the goals, tasks, and answers you’re looking for, then work backwards. Long-term business growth is built on well-integrated systems that save your team time. If you were honest with 13, then 14 should be a breeze. Why? These days, conversion optimization platforms have systems that help you generate hypotheses. Your customer care team is your secret to solving UX problems —and a chance for you to get to know the front row. Engage with this department and create a feedback loop before neglected users put a dent in your business. Make sure the sales reps feel appreciated, and create a system where customer reps can quickly input information about usability problems. Align your teams and let them know you’re relying on them to help improve your product. Header illustration by Liz Pratusevich. Previous articleMove over, UX. A new movement is here.